I’m spending a lot of time in my rocking chair these days, feeding our sweet baby girl. I have a to-do list that only gets one or two things checked off of it. The days are full…feed baby, shower, eat, tell kids to go outside, remind them to be creative and to stop saying they’re bored (at our house you usually get a chore if you say you’re bored), tap a cat nap, put paci in so baby will nap, remind big kids to take care of our new cat, referee sibling squabbles, feed kids, feed baby, eat, read a chapter of a book, etc. Our summer is flying by, but as we hang on for the ride, I want to listen. I want to listen close and listen well to what God is trying to tell me. You see, as happy as I am to have a big family, I feel a little bit lost in transition. This not quite knowing who I am right now is unsettling to my tightly wound self…but I know it’s an important unsettling. I want God to sift me, and get to the heart of some issues that I’ve been struggling with for a long time. 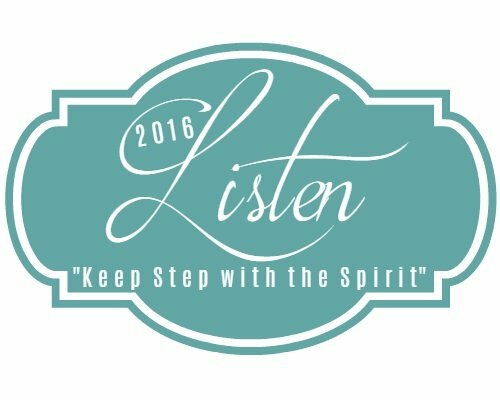 I want to move forward in freedom, but first I need to lean in and listen to what He knows I need to hear. In the spirit of listening, it’s an honor to host the words of the lovely Kristin Hill Taylor as she guest posts today for the Listen Close, Listen Well series. In January 2012, we decided we wanted to adopt for a third time. For two years, we talked with social workers, considered agencies, and got our hopes up about possible adoption situations and then were heartbroken when they fell through. After some particularly frustrating months, we met with an adoption agency the a few days before Christmas 2013. I had reservations but was also excited to see if the new agency would work for us. After two independent adoption processes in 2007 and 2009, we’ve never loved the idea of adoption agencies, but we wanted to be open to what God had for us. But after three hours of sitting across a desk from the well-meaning director, I left knowing it wasn’t a good fit. Usually I have more words than necessary, but this time I didn’t have much to say to my husband Greg. I mostly just cried. I knew it was time to let go. Despite the muddled emotions, hearing God in those moments was clear. He’d probably been trying to speak to my heart before then, but I couldn’t hear him because of my own desires and all the noise around me. The agency we met with was near my hometown that’s a few hours away from our home so we incorporated it into our Christmas travels. There were plenty of distractions. We visited with friends and parented our children. When Greg and I got into bed that night, hours after the agency meeting, we finally had a chance to talk. Our words were in sync. We independently arrived at the same decision: We weren’t going to pursue anything else adoption related. And let me tell you, there is so much assurance when God plants two hearts at the same place before we even open our mouths to discuss it. I needed the clarity and peace it brought. It was a bittersweet realization, but I knew I was hearing God. I knew never to say never, so I didn’t theorize about our future. But we just knew the agency wasn’t for us and we needed to let go and lay it all down. I knew then and know now we serve a God who gives every good gift in the time that is perfect. And he’s good even when I don’t get my way. I just had to look at our two healthy, funny kids who fit perfectly in our family to remember truth. In desiring this third adoption, Greg and I weren’t yearning for someone who is missing, but we believed we had more to give. I also know I’m not who I once was. Being a mom has changed me. How I became a mom has changed me. Like those earlier nearly two years of infertility, the more recent two years of pursuing a third adoption have changed me. God drew me to him and made me think about family and loving the least of these from an eternal perspective. No matter how many times I hold onto life too tightly, God gives me grace and I loosen my grip. It’s not by trying harder or accomplishing more that I’m saved. Only God’s grace does that. It’s that grace that reminds me to listen to One who truly knows. After letting go, we went on with our lives. We converted the empty nursery into a guest room. The desire was there, but so was the freedom to move forward. And then in May 2015, right in the midst of living our ordinary life, a local friend introduced us to the women who would be the birth mom of our third child. God took our desire, molded it in his timing, and managed to surprise us. Our third child was born in September 2015 – more than three years after we decided we wanted to adopt again. We know without a single hesitation she was meant for our family. She came into our lives as God was teaching me about choosing joy and, as I’m sure you can imagine, she epitomizes joy with her easy smile and sweet spirit. 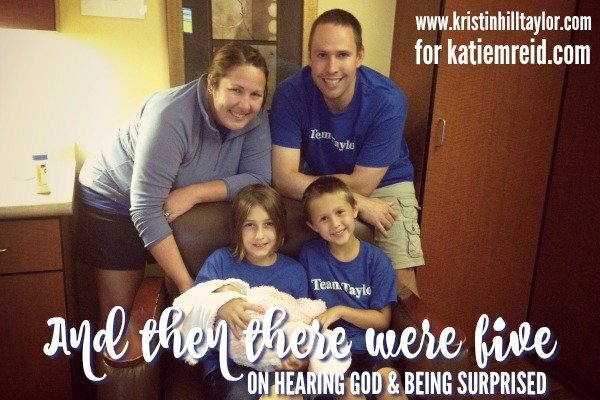 I’m grateful I got to hear God in a new way with his surprise for our family. 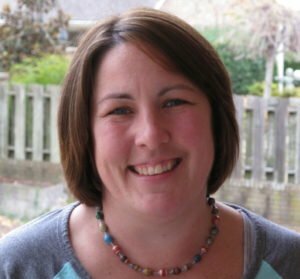 Kristin Hill Taylor believes in seeking God as the author of every story. The main characters in hers are her entrepreneur husband, third-grade girl who never forgets, have-no-fear kindergarten boy, and baby girl who epitomizes joy. You’ll quickly learn her favorite story to tell is how God made them a family through adoption. She lives in Murray, Kentucky, and you can hear more of her stories at www.kristinhilltaylor.com. Love this, Kristin. It’s so beautiful to know that while we’re living and doing life, God is working and orchestrating the most beautiful things for us. And like you said, we don’t have to work harder, we just need to let Him do what He does and believe it is good. Blessed to hear this story and to have seen your family grow!